But what about the people who prefer theirs with nothing on it? 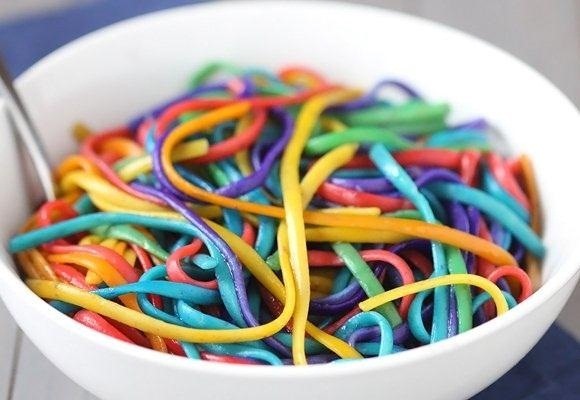 A plain old pile of pasta doesn't exactly look appetizing, so if you want to spice it up a bit (so to speak), try this super easy method for making your very own rainbow colored pasta. All you need is pasta, water, and food coloring. Ali used linguine, but any type of pasta will work, and you can use as many or few colors as you like. Start by cooking the pasta just like you normally would. 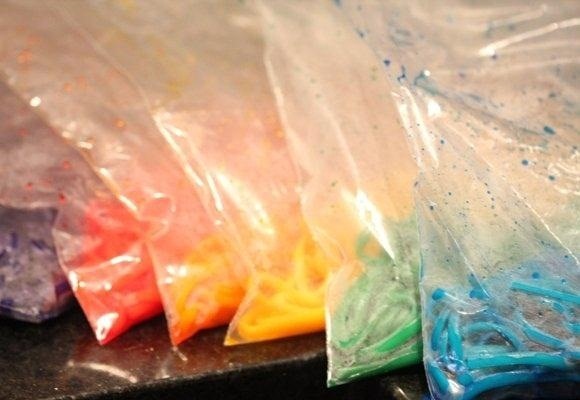 For each color, put 20 drops of food coloring plus 2 tablespoons of water into a large Ziploc bag. Once the pasta is done, drain and rinse it in cold water, then divide it into the bags. Seal each bag and let them sit for a few minutes, then drain off the extra food coloring and you're ready to serve! Check out Ali's post on Quick Dish for more details. And if you're worried about using food coloring, try finding some natural food coloring instead, or make your own from foods like beets or cranberries.